Today I woke up and all I felt like doing is crying. Nothing major has happened to me. I am fine. I can just put it down being hormonal which can feel like a low day. I had agreed to go out for lunch with a cool guy I know. He picked me up from my home, I was actually ready on time today. He knocked on the door and shook my sons hand when he let him in. Which was very cute.. LOL. Once in the car on our drive to our lunch destination, I was quiet. He recognised my low mood and managed to make me giggle in the first fifteen minutes and my mood lifted. He has such a gentle presence about him and a beautiful soul that shines in the sparkle of his eyes. He drove us to a gorgeous restaurant on the shoreline of Geelong. It was a quaint french place with French themed Decor, a bit more swanky than I had imagined on the hour drive there. 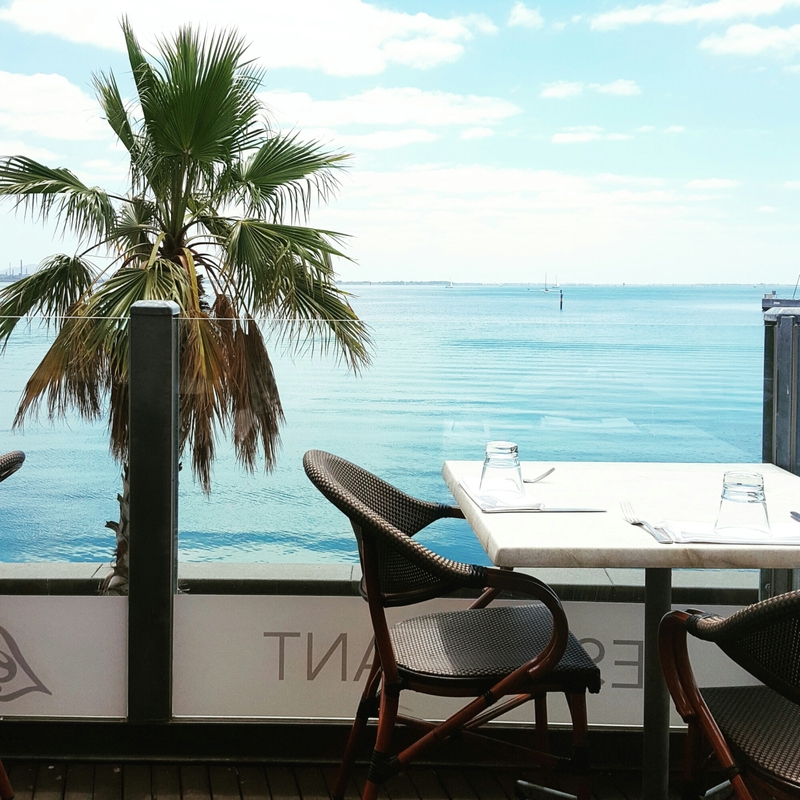 We were seated upstairs on the outside balcony, overlooking the water of Corio Bay. The view was breath taking. The water was calm, little sparkles glistened on the rippling surface like millions of diamonds out in the sun. 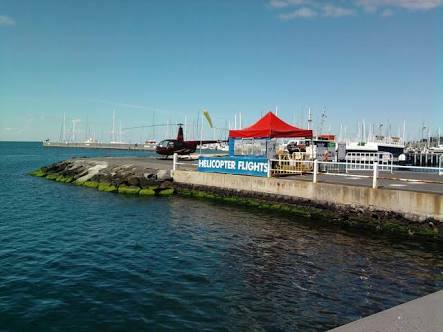 The balcony was above and to one side of the Geelong Yacht club and there was a Helicopter launch pad for scenic flights at the end of the Yacht club pier. As the day was so clear and calm the flights were landing and taking off regularly, which stirred up the water, creating millions more sparkles on the Bay’s surface. The food was absolutely amazing. 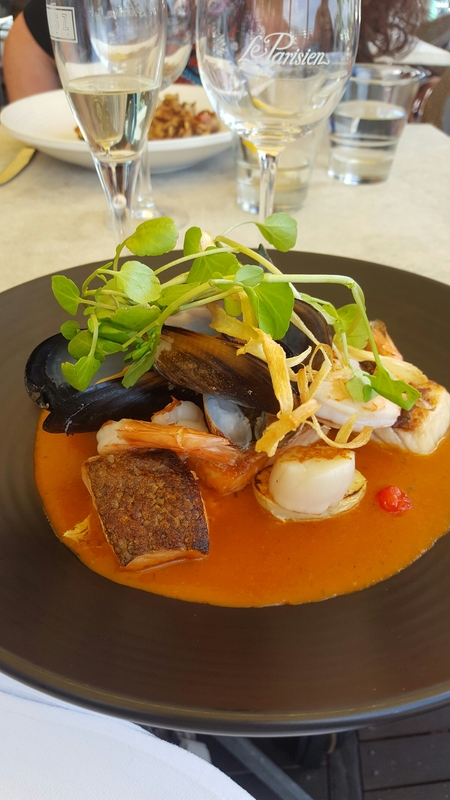 I am a lover of seafood and the choices on the menu were mouth-watering. It was hard for me to choose what to eat, as I really wanted to sample all of them. For entree, Seared Scallops on pork belly with cauliflower puree was my choice and below is the Seafood medley I had for my Main meal. White wine accompanied the delicious lunch and the conversation was flowing. We spent the afternoon looking out over the water, people watching and enjoying delicious food and wine and getting to know each other. The highlight was eating a “Bomb Alaska” for dessert. It has been a food on my bucket list that I have always wanted to try. It’s deep frozen ice-cream with a Meringue shell outside, which is toasted by flaming alcohol carefully poured over the surface. A little hard to see on a bright summers day and I had to be careful not to catch my blonde locks on fire in the breeze..LOL an absolutely delicious dessert, which was well worth the wait and will be ordered any other time I see it on the menu. I must say I thoroughly enjoyed the treasures the day brought me and look forward to our next outing!